MediaBridge is a design intervention designed to bring news readers a broader range of opinions and perspectives. MediaBridge is an intervention designed to bring news readers a broader range of opinions and perspectives. We target everyday news and media consumers who are interested in what others in their network are reading. The intervention connects individuals through their common interests and encourages a more open mindset through personal relationships. These connections and relationships influence users into a more tolerant and accepting mindset. Take for example, Joe Jones a 50-year-old from Alabama who regularly visits Breitbart. 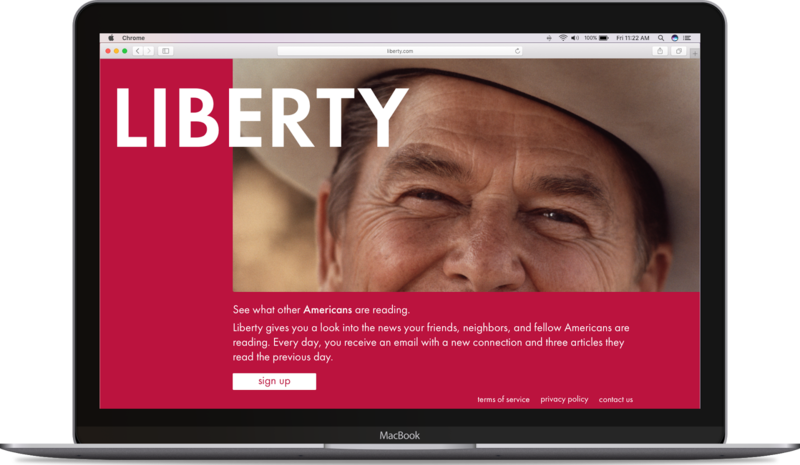 MediaBridge targets Joe via Breitbart ads (MediaBridge targets users through the websites that they frequently browse) with messaging similar to "See what other Americans are reading." After clicking on an ad, Joe is directed to a customized web page visually geared towards more conservative audiences. After learning about and signing up for our intervention, Joe receives a daily email of what another user (in this scenario, Phil) has read. Phil is Joe's best friend's dentist and shares Joe's interests in Vice Presidential history and the U.S. Constitution. Because of this shared connection, Joe is more willing to view the articles that Phil has read. In Joe's daily email, article headlines and summaries are edited with a more neutral tone in order to remove opinion and heavy-handed bias. Due to this lack of tone, Joe reads news stories he wouldn't have, potentially leading him to CNN. Although he may consider CNN to be "fake news," he hopefully becomes more open to a more representative selection of news sources when he realizes he is interested in topics covered by outlets he does not typically visit. MediaBridge doesn't only target conservatives. Take for instance, Amber Campbell a 25-year-old resident of New York City interested in food trends and restaurants in NYC. She rarely reads the news and MediaBridge targets her through Instagram ads, asking if she wants to view what other "foodies" are reading. She signs up for MediaBridge and receives daily emails. One day, she is connected with her boyfriend's cousin who shares her interest in food festivals and Hell's Kitchen. Through daily emails, MediaBridge encourages Amber to read more worldly stories in addition to the stories she currently reads. After a few weeks, MediaBridge includes a progress update. The update shows the type of stories she is viewing and includes encouraging messages to either keep up the good work or view a wider range of news. These messages also draw attention to filter bubbles and bias found in media. For MediaBridge to work, we would need access to an individual's social media and browsing history in order to gather information on their interests, their connections, and the media that they consume. The customized websites would also have to be maintained per interest. MediaBridge came out of one of our earlier concepts, NewsPal, a daily email containing links to articles another user (who has engaged with content similar to you) visited over the course of the day. 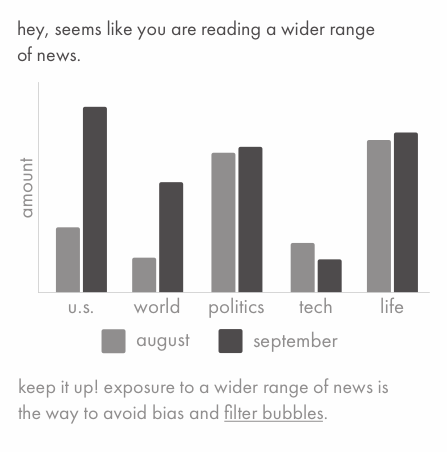 Ideally, NewsPal would connect individuals with similar interests but very different backgrounds. Allowing a grandfather from Nevada to see the news read by a teenager in Alabama and vice versa. One question NewsPal did not answer was how it gets individuals to enroll in such a service who are not interested in what news other individuals are reading. We struggled with developing a non-autocratic way of solving such a problem. 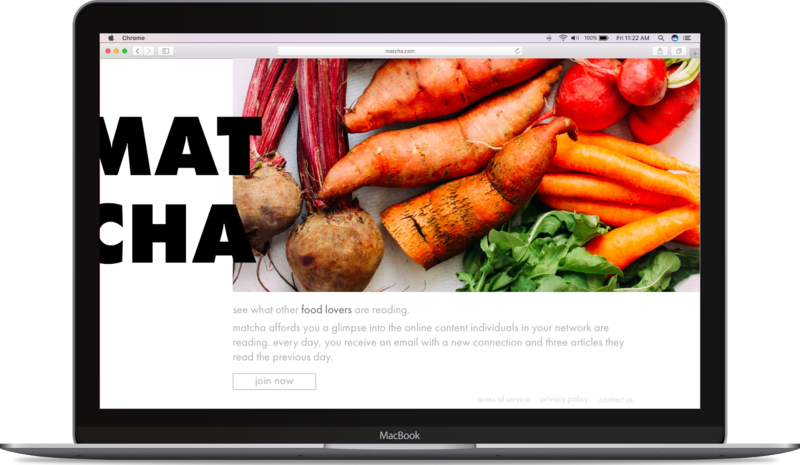 MediaBridge utilizes the hyper targeting tactics used in today's marketing for good. Instead of trying to sell a product, MediaBridge attempts to expose a consumer to a wider range of news through the same tactics. MediaBridge is extremely scalable; it has the ability to target hundreds of very different segments through differently positioned websites. Each of these websites would be designed to attract individuals from a variety of backgrounds and experiences to our service. MediaBridge would provide regular feedback to users through checkups. 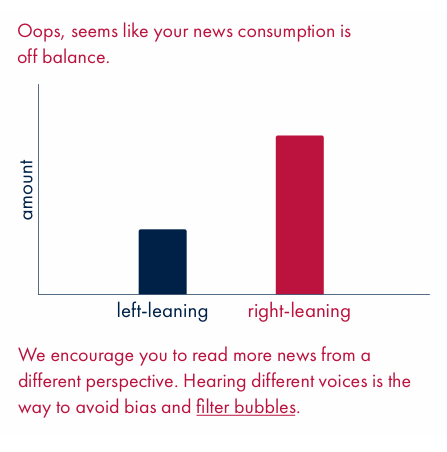 A checkup would inform a user just how balanced their news consumption is. 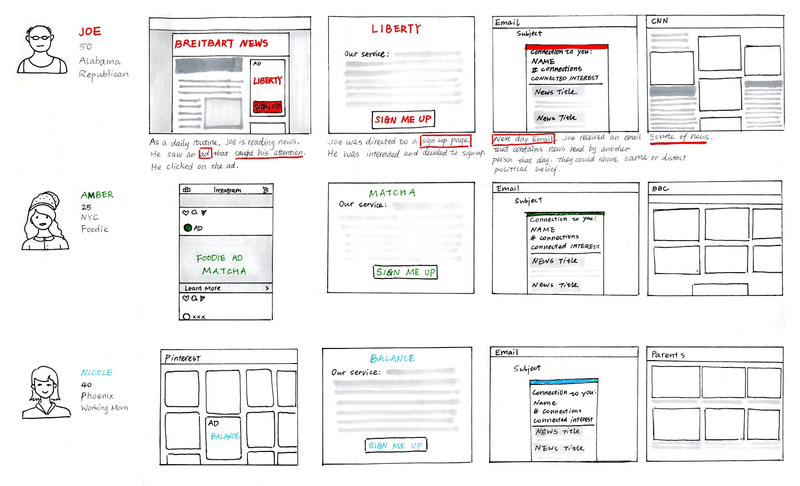 Over time, a user would hopefully make changes in their news consumption to see improvements in their checkups. Charts within checkups would provide ample space to experiment with how to effectively engage with users about their news consumption and provide advice to users about how to diversify that news consumption. While pessimistic, MediaBridge operates under the assumption that the majority of individuals won't be willing to look at other news outlets unless they are incrementally steered from neutral toned articles to articles from news outlets they might have previously ignored or avoided. MediaBridge would hopefully accelerate people’s willingness to engage with content they would not normally engage with.